Passiflora grows wild in Central and South America. Passiflora is a climbing plant that grows in the trees. It grows both on the plains and in the mountains. Some species thrive best with low night temperatures, while others require a night temperature of 16-20 °C, but common to them all is that they need a lot of light. Most Passiflora bloom for just one day, but under optimum conditions the plants will form several long vines with lots of buds, which will produce plenty of flowers. The flowers vary greatly in colour, scent and size. Passiflora is a perennial plant that is ideal for planting out. 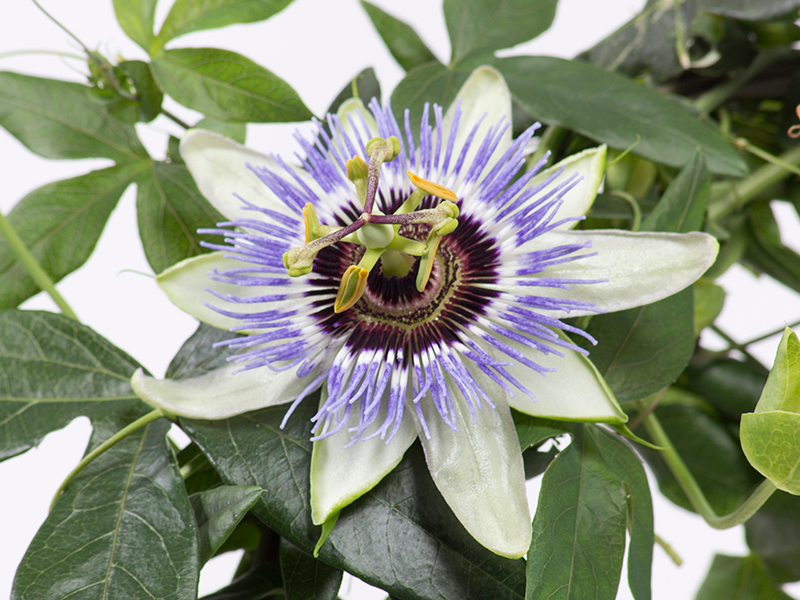 All of our Passiflora are sold with many buds and in good quality. Most of the Passiflora sold are from species with few varieties. We sell Passiflora from March to August in various models: frames, pyramids, etc. At the nursery, we use biological pest control in the form of natural predators that we distribute among the plants.